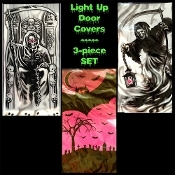 Spooky Light-Up GRIM REAPER VAMPIRE BATS Sheer Colorful Window Door Covers Wall Murals SET of THREE (3) will give Halloween guests a scare as they approach your door. Scary gothic horror theme print LED bright flashing lights are displayed behind the eyes. Transform doors, windows or walls into a truly thrilling scene with these chilling light-up Halloween scene setters. They are sure to send a shudder down the spine of trick-or-treaters and guests alike with their spooky glowing lighted eyes.